If you’re reading this website, chances are you’re considering or preparing for shoulder surgery. That’s good news — because shoulder replacement has been proven to relieve severe shoulder pain and restore function in the vast majority of patients. And now there’s even better news. 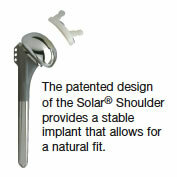 Advancements in the design of shoulder prosthesis allow the potential for you to restore your range of motion. Developed with patient comfort in mind, the Solar® Shoulder is designed for a more natural feel throughout range of motion. The shoulder is the most moveable joint in the body. It is made up of three bones: the collar bone (clavicle), the shoulder blade (scapula), and the upper arm bone (humerus), as well as two important joints that allow for movement. The glenohumeral joint, also known as the shoulder joint, is a ball-and-socket that connects the humerus to the shoulder blade. This joint allows free movement of the arm so that it can rotate in a circular fashion. The rotator cuff is made up of four muscles and their tendons, which act to hold the upper arm (humerus) to the socket of the shoulder (glenoid fossa). The rotator cuff also provides mobility and strength to the shoulder joint. A smooth substance called articular cartilage covers the surface of the bones where they touch each other within a joint. This articular cartilage acts as a cushion between the bones. What Causes Shoulder Joint Pain? Sometimes called degenerative arthritis because it is a “wearing out” condition involving the breakdown of cartilage in the joints. When cartilage wears away, the bones rub against each other, causing pain and stiffness. OA usually occurs in people aged 50 years and older, and frequently in individuals with a family history of osteoarthritis. The most common cause of shoulder replacement, OA can occur without a shoulder injury. However, this seldom happens since the shoulder is not a weight-bearing joint like the knee or hip. Instead, shoulder OA commonly occurs many years following a shoulder injury, such as a dislocation, that has led to joint instability and repeated shoulder dislocations — damaging the shoulder joint so that OA develops. Produces chemical changes in the joint space that cause it to become thickened and inflamed. In turn, the synovial fluid destroys cartilage. The end result is cartilage loss, pain, and stiffness. RA affects women about 3 times more often than men, and may affect other organs of the body. May develop after an injury to the joint in which the bone and cartilage do not heal properly. The joint is no longer smooth, and these irregularities lead to more wear on the joint surfaces. Other causes of joint pain include avascular necrosis, which can result when bone is deprived of its normal blood supply (for example, after organ transplantation or long-term cortisone treatment), and deformity or direct injury to the joint. Additional tests as needed. These may include laboratory testing of blood, urine, or joint fluid and/or a bone scan of the joint and surrounding soft tissue. If you and your orthopaedic specialist decide that shoulder joint replacement surgery is an option to relieve your pain, the orthopaedic specialist will provide the details of which type of artificial joint he or she will use, what you need to know to prepare for the surgery, how the surgery will be performed, and what results you can expect after the surgery. Ready to Consider Shoulder Joint Replacement? Replacement of an arthritic or injured shoulder is less common than knee or hip replacement. When necessary, however, shoulder replacement typically provides the same potential benefits as those procedures, including relief of joint pain and restoration of more normal joint movement. Restoration of movement is particularly important in the shoulder, the body mechanism that allows your arm to rotate in every direction. If you’re experiencing severe shoulder pain and reduced shoulder movement, there are probably many daily activities you can no longer do — or do as well or as comfortably — as before your shoulder problems began. 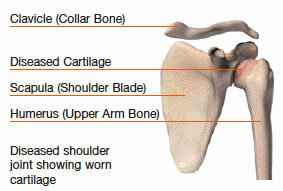 The humeral component (metal) is implanted in the humerus. The glenoid component (plastic) replaces the surface of the glenoid socket. A Partial Shoulder Joint Replacement is used when the glenoid socket is intact and does not need to be replaced. In this procedure, the humeral component is implanted, and the humeral head is replaced. A Total Shoulder Joint Replacement is used when the glenoid socket needs to be replaced. 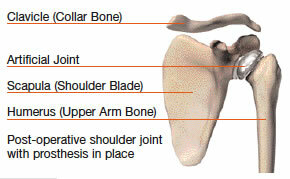 All three shoulder joint components are used in this procedure. How Long Will an Artificial Shoulder Joint Last? Loosening is a common cause of joint replacement surgery failure. A small amount of loosening and bone loss will occur. If it reaches a certain degree, a revision surgery may be indicated. Besides infection, possible complications include blood clots (the most common complication) and lung congestion, or pneumonia. Some shoulder-specific complications that may occur are nerve injury — since many major nerves and blood vessels travel through the armpit (axilla) — and dislocation, particularly just after the replacement surgery. Complications may require medical intervention including additional surgery and, in rare instances, may lead to death. Your doctor should discuss these potential complications with you. During your hospital stay, your orthopaedic specialist works closely with nurses, physical therapists, and other healthcare professionals to ensure the success of your surgery and rehabilitation. 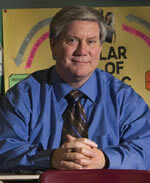 Usually a case manager is assigned to work with you as you move through your rehabilitation routines. As the days progress, expect to become more independent in your movements. If you need to work with a physical therapist after your joint replacement, the therapist will begin an exercise program to be performed in bed and in the therapy department. The physical therapist will work with you to help you regain muscle strength and increase range of motion. The success of your joint replacement will strongly depend on how well you follow your orthopaedic specialist’s instructions. As time passes, you have the potential to experience a dramatic reduction in joint pain and a significant improvement in your ability to participate in daily activities. Remember, even if your orthopaedic specialist determines that shoulder joint replacement is a good medical option for you, it is still up to you to make the final decision. The ultimate goal is for you to be as comfortable as possible, and that always means making the best decision for you based on your own individual needs. Bottom line: You don’t have to live with severe shoulder pain and the functional limitations it causes. If you have not experienced adequate results with medication and other conservative treatments, shoulder replacement may provide the pain relief you long for — and help you to return to the lifestyle and activities you enjoy. Stryker Corporation or its divisions or other corporate affiliated entities own, use or have applied for the following trademarks or service marks: Solar and Stryker. All other trademarks are trademarks of their respective owners or holders. 1. Hanssen, A.D., et al., “Evaluation and Treatment of Infection at the Site of Total Hip or Knee Arthroplasty,” JBJS, Volume 80-A, No. 6, June 1998, pp. 910-922.